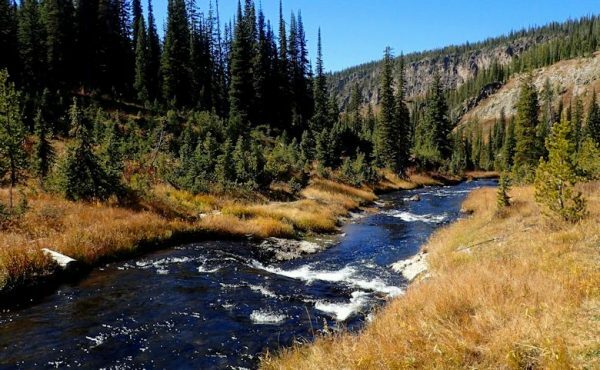 The Winegar Hole Wilderness was designated specifically to provide high quality habitat for the grizzly bear.The United States Congress designated the Winegar Hole Wilderness in 1984 and it now has a total of 10,715 acres. All of this wilderness is located in Wyoming and is managed by the Forest Service. Part of the Greater Yellowstone Ecosystem, this Wilderness is located on the southern boundary of Yellowstone National Park in western Wyoming. The low rolling hills with numerous wetlands, meadows and streams is volcanic in origin. A forest of lodgepole pine, Douglas fir, subalpine fir, and Engelmann spruce covers much of the area. The area is managed as a trailless area to provide maximum security for the grizzly bear except for one short trail that provides access to Yellowstone National Park. A permit is required to camp overnight and dogs are not allowed in Yellowstone National Park. Grizzly bears in Winegar Hole Wilderness. Photo courtesy of US Fish and Wildlife service. Maximum group size is 20 people. Larger groups must split into two or more smaller groups and remain a minimum of one half mile apart. Storing equipment, personal property or supplies is prohibited. The disposal of debris, garbage and other waste is prohibited. Attracting wildlife using salt is prohibited. Shortcutting a switchback is prohibited. Wagons, carts (including game carts and wheelbarrows), bicycles, and other motorized, mechanized, or wheeled vehicles are prohibited. Wheelchairs are allowed. The use of more than 20 horses or pack stock is prohibited. Hitching stock within 200 feet of a lake or 100 feet of a stream is prohibited. All feed including hay, hay cubes, straw, grain or other crop or mulch products must be certified as weed free. Food and other attractants must be properly stored while unattended and at night. Camping within 200 feet of any lakeshore and 100 feet of any stream bank is prohibited. Camping for longer than 16 days is prohibited.